Coinciding with the Defexpo India 2008, the 5th International Land and Naval Systems Exhibition organised by the Ministry of Defence, Government of India in association with CII, the 4th India Defence Industry Summit and 15 Defence Technology Seminars were organised. The India Defence Industry Summit held on 16 February 2008 was focussed on India’s defence industrial policy and procurement process; leveraging India’s defence industrial policy for co-development and co¬production of defence equipment - international perspective. The Seminar was inaugurated by Mr Pradeep Kumar, Secretary (Defence Production) and other key speakers at the Seminar include Dr Prahlada, Chief Controller R & D (SI) & Distinguished Scientist, DRDO, Mr Shashi Kant Sharma, Director General Acquisition, Ministry of Defence, Mr Satyajeet Rajan, Joint Secretary (X) and Chairman, Defence Offset Facilitation Agency, Ministry of Defence, and Mr Atul Kirloskar, Chairman, CII National Committee on Defence and CMD Kirloskar Oil Engines Limited. 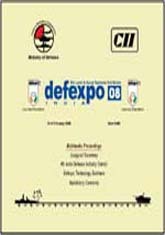 Given below is the list of Defence Technology Seminars held on 18 & 19 February 2008 at New Delhi. •Arms & Ammunition, Chaired by Lt Gen BK Sisodia, VSM, Director General Ordnance Services, Indian Army •Sighting Equipment (NVDs), Chaired by Lt Gen Rajender Singh, SM, VSM, Director General – Infantry, Indian Army •Helicopters, Chaired by Brig Harish Arora, SM, Deputy Director General, Army Aviation, Indian Army •Wheeled & Track Vehicles, Chaired by Maj Gen D Bhardwaj, VSM, Director General Mechanised Forces, Indian Army •Military Engineering, Chaired by Lt Gen RR Goswami, Engineer-in-Chief, Indian Army •Artillery Technology, Chaired by Maj Gen VK Tiwari, Additional Director General – Artillery, Indian Army •NBC Protection Equipment / Systems, Chaired by Lt Gen (Dr) DDS Sandhu PVSM (Retd. ), Former Director General Ordnance Services •IT Applications for Defence, Chaired by Lt Gen Avadhesh Prakash, AVSM, VSM, Director General Information Systems, Indian Army •Simulators for Military Training, Chaired by Maj Gen VK Ahluwalia, AVSM, YSM, VSM, Officiating Director General Military Training, Indian Army •Warship Design and Production, Chaired by Rear Admiral MK Badhwar, VSM, Director General of Naval Design, Indian Navy •Naval Armaments, Chaired by Rear Admiral Deepak Taneja, VSM, Director General of Naval Armament Inspection, Indian Navy •Defence Communications, Chaired by Lt Gen SP Sree Kumar, AVSM, ADC, Signal Officer-in¬Chief & Senior Colonel Commandant, Indian Army •Surveillance Systems and UAVs, Chaired by Air Marshal PV Naik, VSM, ADC, Vice Chief of Air Staff, Indian Air Force •Submarine and Underwater Technologies, Chaired by Cmde Rajiv Sawhney, Executive Director, National Maritime Foundations •Missile and Missile Launchers, Chaired by Lt Gen ZU Shah, SM, VSM, Deputy Chief of Army Staff (P&S), Indian Army .